By losing the dough and using thinly pounded chicken as the crust, I put my own low-carb spin on traditional pizza. Pile on sauce, veggies, and cooked turkey sausage for a zesty, low-cal splurge! A perfect pizza alternative for those with type 2 diabetes. Preheat the oven to 375°F. Line a baking sheet with aluminum foil, and coat the baking sheet with oil spray. Pound the chicken breasts very thin using a mallet or heavy can and arrange the chicken breasts on the prepared baking sheet. Bake for 15 minutes, or until fully cooked. Sauté the bell pepper, onion, and mushrooms in a skillet coated with oil spray over medium-high heat until soft and browned, about five minutes. Recoat the same pan with oil spray and cook the sausage, turning occasionally, until fully cooked. Slice the sausage into rounds. 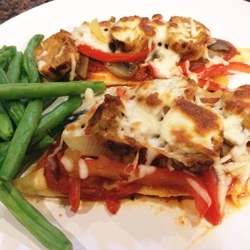 Top each cooked chicken breast with 2 tablespoons marinara sauce, ¼ of the sautéed vegetables, ¼ of the turkey sausage slices, and 2 tablespoons cheese. Place the chicken back in the oven until the cheese is melted and bubbly, about 3 minutes. *Note: For celiac disease, check marinara sauce label to ensure it’s gluten-free.